POWACLENZ is formulated to quickly cut through heavy grease, oil, fat, carbon, traffic film, dye and other soiling. 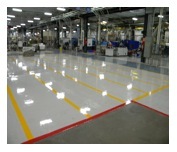 Can be used on floors, walls, machines, bare metals, painted surfaces and other hard surfaces. Non-flammable, non-toxic, non-corrosive and odourless. Simply spray, brush, mop or wipe POWACLENZ onto the surface to be cleaned, allow to penetrate the soiling and wipe off or, rinse with water. In pressure wash machinery, dilute POWACLENZ accordingly.